We recycle extra and unwanted road race, endurance event, sport and academic medals and use the proceeds to fund our charity/fundraising endurance events. Help keep recyclable metal, textiles, plastic and cardboard out of landfills and help support some great charities. Do You Need Clean Race Ribbons? 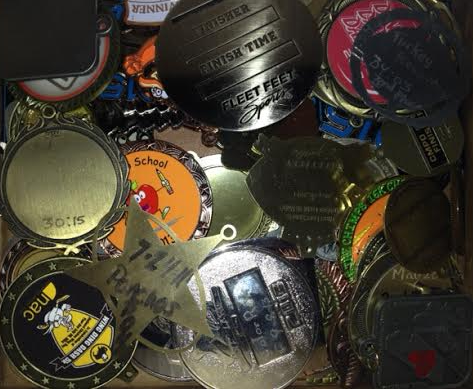 Sports Medal Recycling is a group of athletes that recycle unwanted and extra medals from all sports, and use the proceeds for our charitable fundraising minimums for race or event entries. We can also recycle academic and achievement medals. Medals can be sent in at any time: we process shipments year-round. NO TROPHIES OR PLAQUES PLEASE. We welcome to you send in extra, unused, or no-longer-wanted medals from any sport, including: road races, triathlons, obstacle course events, skiing, rowing, swimming, volleyball, wrestling, rugby, skating, horse jumping, kid's races, bike rides, 5Ks, 10Ks, mud runs, fencing, relays, cheerleading, senior games, century rides, virtual races, collegiate medals, etc. Bottle opener or key chain medals are welcome! Academic medals are welcome too! We have processed medals for honor societies, reading awards, etc. This is a complete recycling program. We recycle the cardboard shipping boxes, and any newspaper, paper or cardboard used in shipping. We recycle the metal from the medals. We send the ribbons to textile recycling. All plastic bags, air mailer bags and bubble wrap go to plastics recycling. Race and event organizers- know that your extra, unwanted, or overstocked medals and medals from canceled events will be recycled and kept out of landfills (plus you're not paying to store old medals anymore). Athletes- clear out any old medals you had at home that you no longer want, and know that they are going to a greater purpose. We've kept hundreds of pounds of metal, fabric, plastic and cardboard from going to the trash. We get to help support great 501(c)3 nonprofits. Do not send trophies of any kind or material. Please check out the Nationwide Trophy Recycling Program. They can re-purpose trophies that are in good condition. We are not affiliated with them, but we are often asked about what people can do with old trophies, and was the national resource that we found. 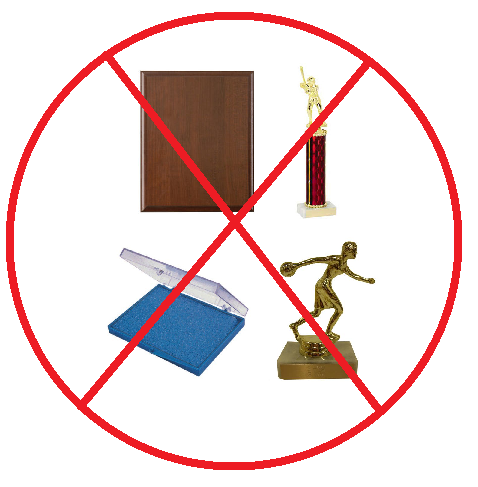 Please do not send: Plaques of any kind; Medals or awards made of: glass, wood, ceramic, foam, or plastic; Banners (cloth or plastic), or smoke, fire or mold-damaged items. If these are sent, unfortunately they will go in the trash. Do not send in the plastic cases and foam inserts some medals come in. These are not recyclable and will be thrown out. 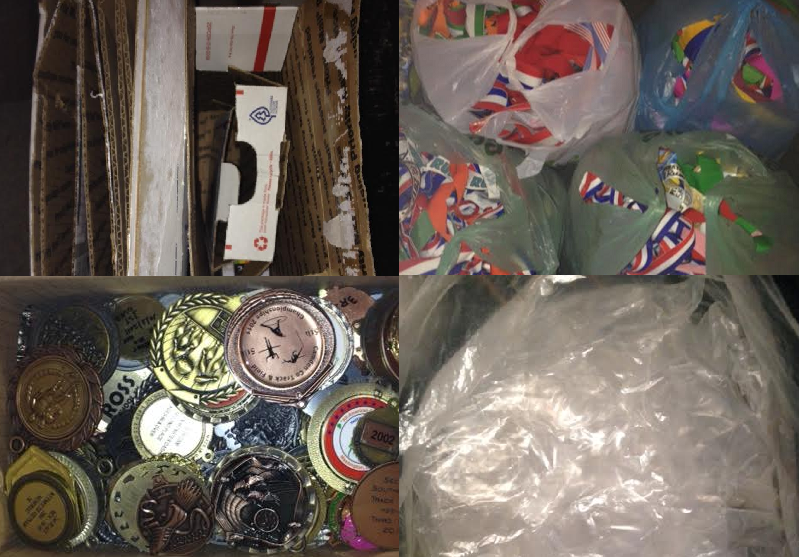 For packing: if the medals do not completely fill the box you're using, please enclose the medals in plastic wrap, bubble wrap, air bags, paper, cardboard or newspaper (we can recycle all of these). 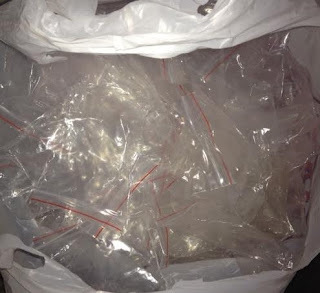 Do not use Styrofoam or packaging peanuts for packing- we cannot recycle them (and they typically get crushed in shipment from the weight of the medals). Medals do not need to be wrapped individually- the key is they just need to not shake or slide around the box. We find this damages the boxes in transit. We cannot recycle bubble mailer envelopes or plastic envelopes. If you can ship in a cardboard box with bubble wrap, plastic air bags, or newspaper, that's the best option! Another great idea- if you have leftover cloth bags (cinch, drawstring or tote) from events or races, you can use the bag in place of newspaper or bubble wrap to ship the medals. Cheapest shipping options: USPS Flat Rate boxes (one rate for up to 70 pounds). These boxes are available for free at your local post office or via an online order, and are available in small, medium and large flat rate sizes. Please carefully tape the boxes or envelopes to ensure the box doesn't break in transit due to the weight of the medals. Ship as a group: we've had workplaces, gyms, and teams collect medals together and ship in one box to save on postage. Our shipping address is secure, can receive USPS, UPS, or Fedex, and your boxes will be protected from bad weather. We have limited availability to pickup in the northeast for large quantities of medals (think several boxes). Our volunteers often travel for races and may be in your area. Send us an email! 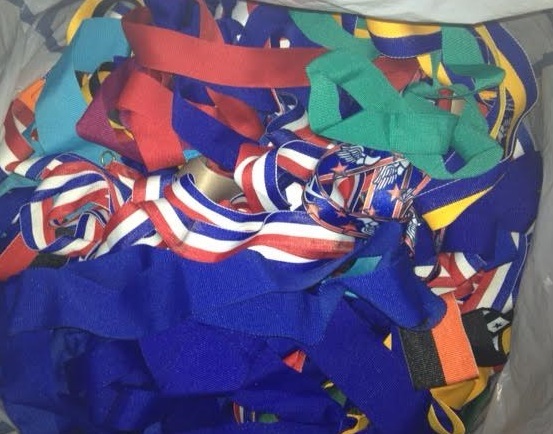 We will gladly send clean, unused, non-branded ribbons to charity races that make their own medals or to nonprofits that can use them for activities or special events! These ribbons come from the extra medals that races didn't use. Please see this page for more information. We regularly make donations or fundraise ourselves to participate in events like charity rides or to participate in road races, etc. Some events we participate in require a fundraising minimum for a race bib or event entry. We use our recycling proceeds for their donations. If we are not actively fundraising for an event, then we donate to our friends' fundraising efforts. We only make donations to fundraising efforts that support registered 501(c)3 nonprofits in the United States only. We do not make any donations to requests to help individuals. We only make donations on verified nonprofit website fundraising pages ourselves. You can view screenshot examples of our our past donations made to athlete fundraising efforts here. We also share photos of our donations on social media. Sport and academic medals are sent to medal recycling. The ribbons are brought to textile recycling. All plastic bags, air bags, and bubble wrap are brought to plastic recycling. We also recycle all cardboard boxes, newspaper and packing paper. Want to ask about something not listed above or on our FAQ page? Please contact us at sportsmedalrecycling@gmail.com for more information. We now have a e-newsletter! We will send out updates on our recycling efforts, our charitable donations, our future growth, and more. We will never share or sell your personal information with anyone.